This is indeed a happy news for Virat Kohli and all his fans out there. 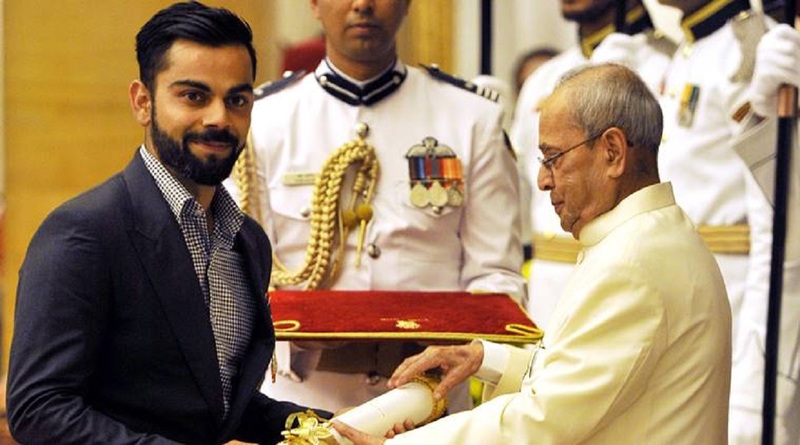 Our talented cricketer receives Padma Shri Award on Thursday from the President of India, Pranab Mukherjee at Rashtrapati Bhawan. The award is the fourth-highest civilian award in India. Virat Kohli took the team of India on Number One Test Ranking after Mahendra Singh Dhoni left the rein. Reportedly, there were no recipients for the Padma Bhushan and Padma Vibhushan Award. There were a total of 8 sports-persons who were chosen for the award. Along with Virat Kohli, hockey captain PR Sreejesh, Rio Olympics heroes wrestler Sakshi Malik, gymnast Dipa Karmakar, Paralympian Mariyappan Thangavelu and Deepa Malik, discus thrower Vikas Gowda and blind cricket team captain Shekhar Naik were there. They all are among the 89 Padma Awardees who were awarded by the Government on the Republic Day.